There is nothing quite like enjoying a great cup of coffee made from the best tasting coffee beans you can find. Some people like waking up to the aroma and the taste of a freshly made cup of coffee first thing in the morning, while others find relaxing with a large cup of coffee at the end of the day is the perfect way to wind down. While not everyone agrees on where or when to enjoy a cup of coffee, the one thing most people do agree on, is that the best tasting coffee starts with the best coffee beans. Sixteen years ago, the Kicking Horse Coffee Company was born. Today, it is Canada’s number one Fair trade coffee. Depending on your preference, you can find a blend of coffee that has a rich aroma and that will perk up your taste buds. What’s not to like about this coffee. It’s organic, which means you will be getting the pure taste of coffee, not coffee that is mixed with the taste of chemicals from fertilizers or insecticides. It’s fair trade, so you know that people who are involved in the growing and manufacturing of this coffee aren’t being taken advantage of or working for slave wages. The reviews for these coffee beans are quite good with Kicking Horse coffees receiving very positive feedback from customers. However, keep in mind that when reading the reviews for your chosen blend, that the blends are all incorporated into one review on the majority of websites, so make sure you are reading the reviews for the right blend. Of course, just how good a cup of coffee tastes depends on a number of different factors, including the way the coffee was made, and the individual taste of the person drinking the coffee. However, it should be noted, that out of several hundred reviews across the web, only a tiny percentage of people gave this coffee poor feedback. This at least indicates that the large majority of people who tried this coffee really like it. Coffee Bean Direct has been in business since 2004, and in recent years, have offered an increasing number of fair trade and organic coffees. Their Dark Brazilian Santos Whole Bean Coffee is just one of the many coffees this company offers. The idea of this coffee being packaged and shipped immediately upon roasting is a definite plus, as not only should this lock in the freshness of the coffee, but the flavor and aroma as well. Reviews for the Dark Brazilian Santos whole bean coffee in the 5 pound bag gets great reviews receiving wonderful compliments from customers. Regardless of reviews or recommendations, each individual chooses coffee that appeals to their individual taste. With so many favorable compliments for this coffee, it may be worth a try for those searching for a brand of coffee that they love. San Francisco Bay Coffee is manufactured by the Roger’s Family Coffee Company who have been making fine tasting coffee and tea since 1979. Whether manufacturing their own organic coffee, or purchasing fair trade coffees and teas, this family is dedicated to bringing you the best coffee possible at the lowest possible prices. It is difficult not to be a little impressed by a company that creates their own custom blends of coffee, and repeatedly inspects their coffee during every step of the process. You get the impression that this company really cares about the finished product. Reviews for San Francisco Bay Coffee French Roast are exceptionally good, with this coffee scoring high with customers. With an average of over 90% of customers rating this coffee extremely high across the internet, it is clear that most people who try this coffee really like it, and feel that San Francisco makes one of the best tasting coffee bean blends to be found. 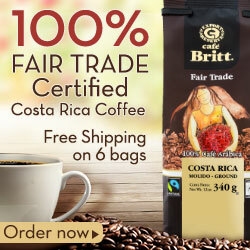 Finally, another awesome brand of coffee with consistently great reviews is Cafe Britt. It’s even fair trade which is a great thing to support. It seems all their individual varieties are rated very highly so whatever your taste is they have it. They are sold on Amazon , which is ideal if you’re getting a bag or two but I would highly recommend buying them directly if you’re stocking up since you can get a better deal on the Cafe Britt website . Plus for a limited time you can use code “OFFERS1O” to save an additional $10 off 6 bags or more.